Dark circles or shadows or black rings are the dark discolorations of your skin under your eyes. Although it is really not a serious problem, its prevention can make you feel serious because it makes you look tired, exhausted, older, and unhealthy. Dark circles are one of the most common problems which can affect too many people in all age groups. The major causes of the appearance of dark circles are stress, dry skin, working for long hours in front of the computer, lack of sufficient sleep, unhealthy diet, aging, health problems, heredity, prolonged crying, etc. 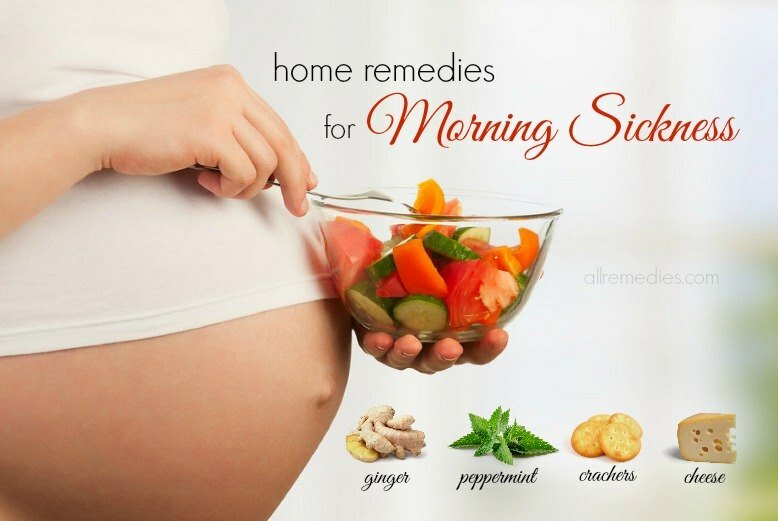 There are many useful and natural home remedies that are effective in removing dark circles. In this article, we will know all about lemon for dark circles. Being an acidic fruit, lemon contains vitamin C and citric acid that has been used to treat many beauty and health problems including dark rings under eyes. 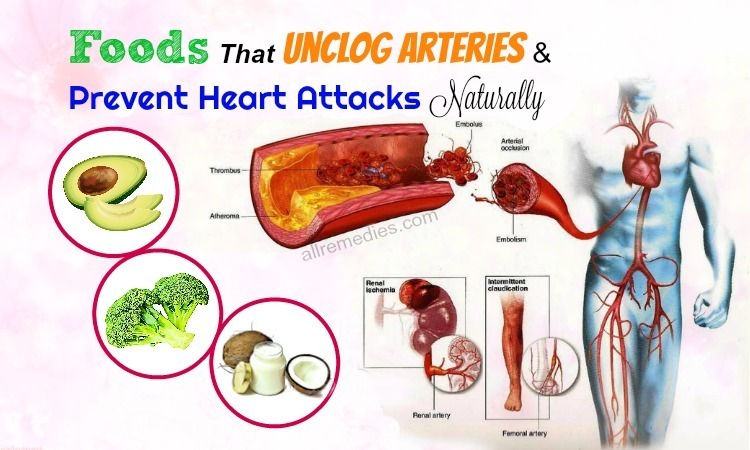 It is an available ingredient in your home, effective, and cheap, but gives you long lasting results to this problem. In this article, AllRemedies will show you 22 useful ways on how to use lemon for dark circles under eyes without any side effect. This article listed the best methods that use lemon along with some other natural ingredients to remove dark circles effectively at home from reliable sources. 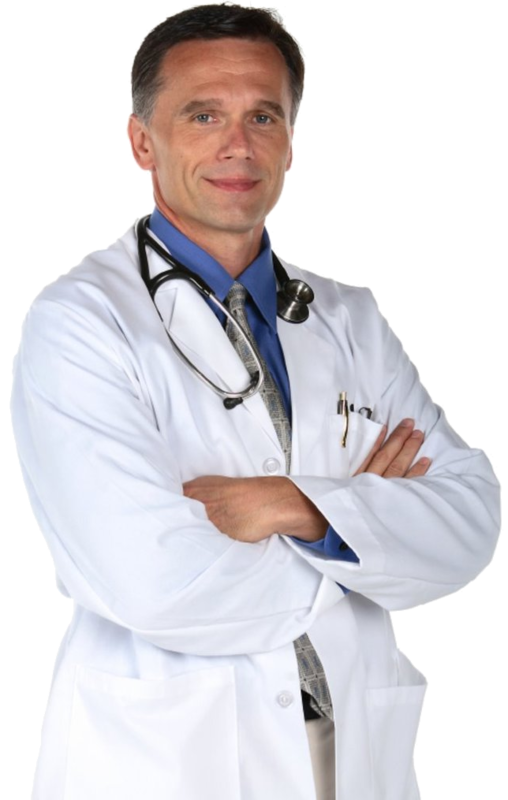 However, it is not intended to give medical advice and it is solely for the informational purpose. Keep reading this article to learn these useful methods on how to use lemon for dark circles under eyes. How can lemon help to remove dark circles? Here are the benefits of lemon, which are used to fade away the dark rings under your eyes. Lemon contains a bleaching property that aids in lightening the dark rings under your eyes. 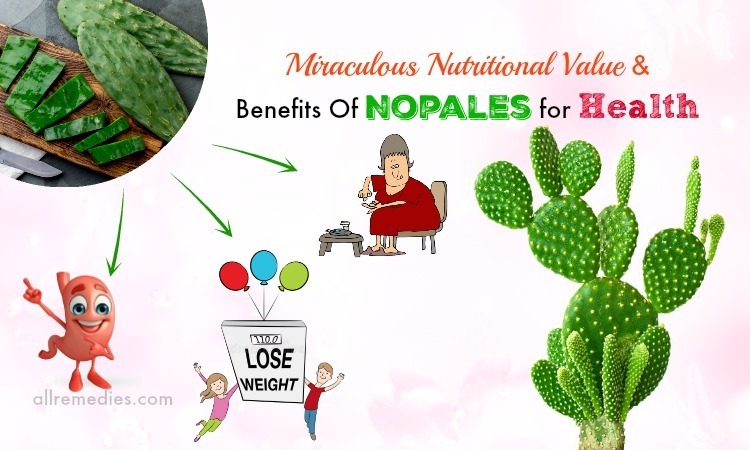 It is very rich in vitamin C that will help you to eliminate this problem by strengthening your immune system and the cells and vessels all around your eyes. 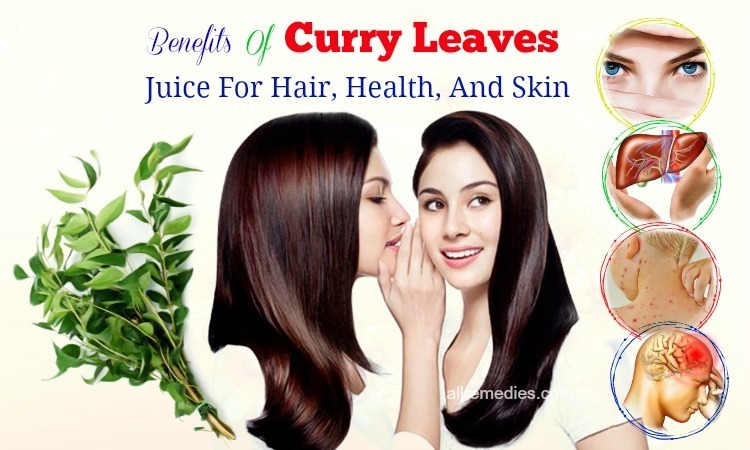 It contains moisturizing and skin lightening properties that assist you in giving you a smooth skin, shrinking blood vessels, and retaining the fluids beneath your eyes to relieve the dark circles as well as puffy eyes. 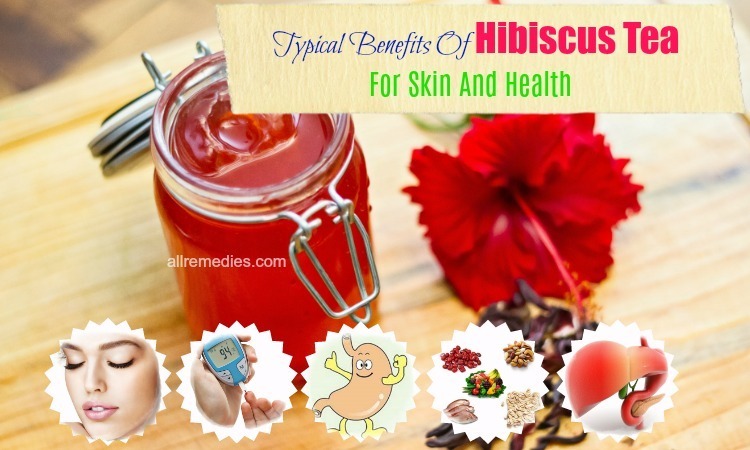 It contains an antiseptic property that can help to treat the allergies and diseases to remove the dark circles. 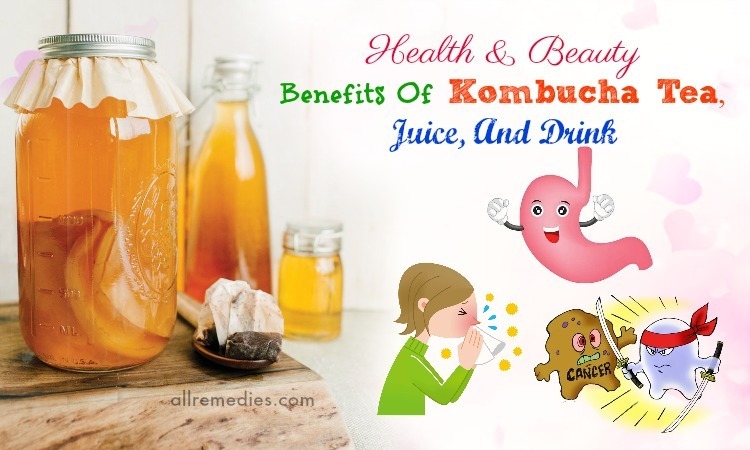 As you know, allergies and some infections are the causes of this problem. 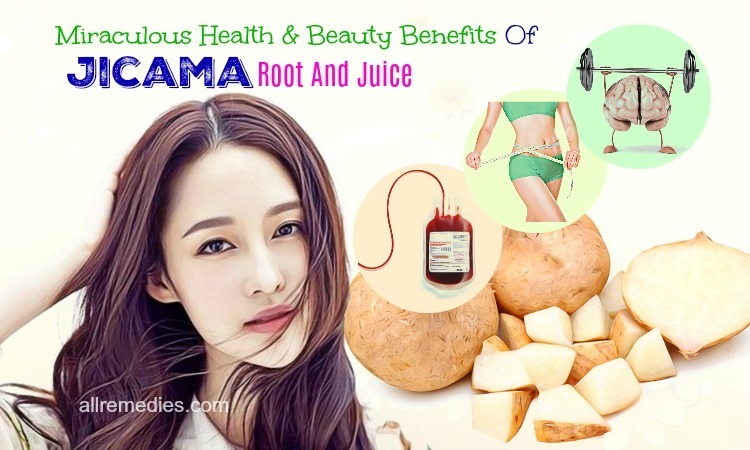 It is very rich in vitamin B, proteins, riboflavin, phosphorus, carbohydrates, magnesium, and calcium, which help to give you all the strength to eliminate the dark circles. 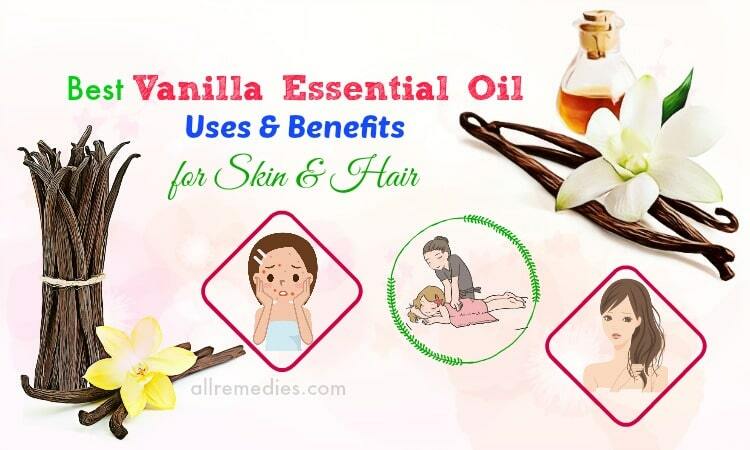 It has citric acid that helps to remove the dead skin cells effectively and it works as an astringent agent, which aids in fading the dark circles, wrinkles, and fine lines. 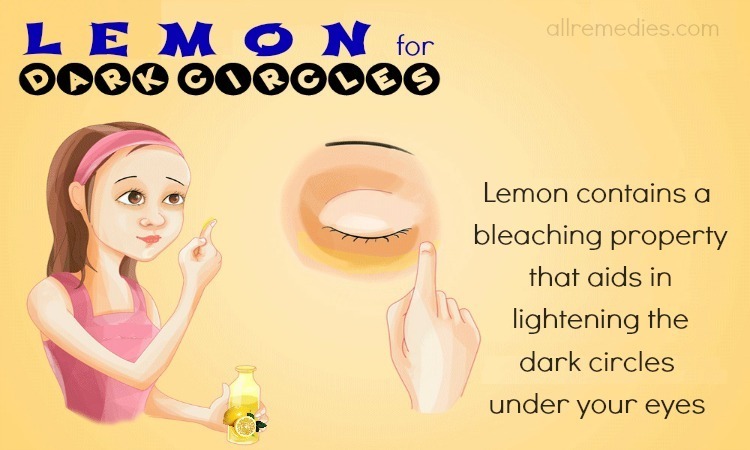 Here are some useful ways on how to use lemon for dark circles under eyes that you should try! Firstly, you cut a small lemon into two halves. Then, you squeeze it into a small bowl to extract its juice. Now, you dip a cotton ball into this juice for one minute. Next, you dab it onto the affected eye areas. After that, you let it stand on for about 15 to 20 minutes. Finally, you wash these areas with plain water and pat your skin dry. Note: If you have a dry or sensitive skin, you have to dilute lemon juice with a little water before applying it onto the dark circles to decrease the side effects such as burning or itching or stinging sensation. Firstly, you add all these above ingredients in a clean bowl. Then, you mix them thoroughly to make a thick paste. Next, you apply this thick paste onto the dark circles evenly. Now, you leave it on for 30 to 35 minutes. Finally, you rinse the applied areas with clean water. Both lemon and tomato work as a great skin lightening agent that can help to clear out the dark circles around your eyes. 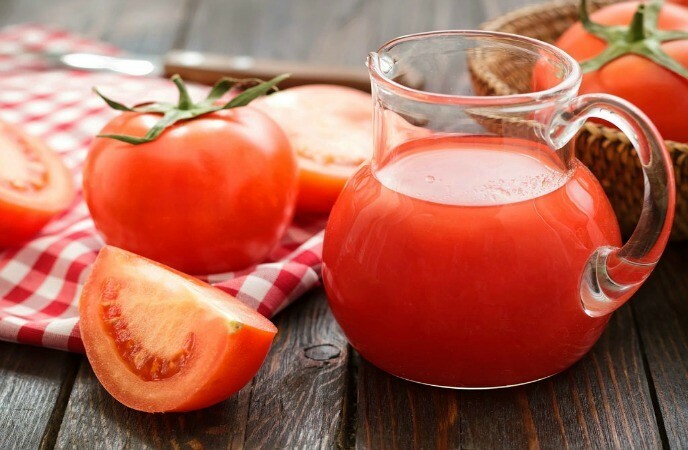 At first, you take equal quantities of tomato juice and lemon juice in a clean bowl. Then, you stir them well and apply the mixture gently onto the affected areas. Now, you allow it to stand on for 10 to 20 minutes. Finally, you wash the areas with cold water. 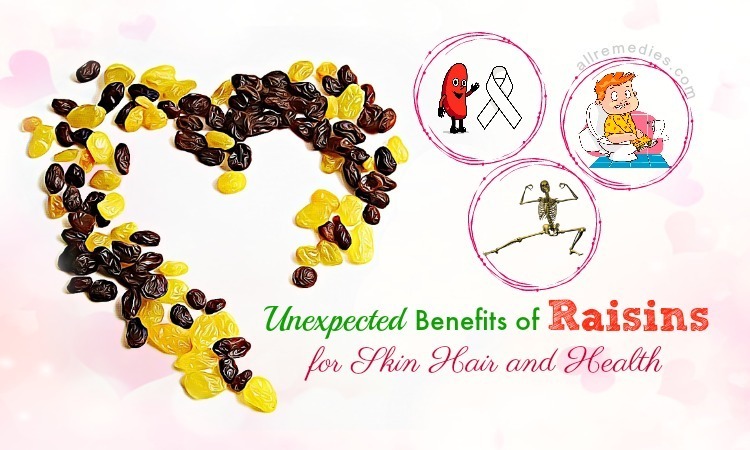 You have to follow the same remedy for twice per day on the daily basis to get the best results. Mint leaves contain cooling, antibacterial, antiseptic, and antimicrobial properties that can constrict blood vessels and clear dark circles. Besides, lemon has a bleaching property that aids in fading the dark circles. Firstly, you blend these fresh mint leaves to make a fine paste. Then, you add fresh lemon juice into it. Next, you stir them well and apply the mixture onto the dark circles properly. Now, you wait for 10 to 15 minutes. After that, you rinse the areas with lukewarm water. This combination of white potato and lemon juice is very effective in treating dark circles, puffy eyes, or other skin problems. 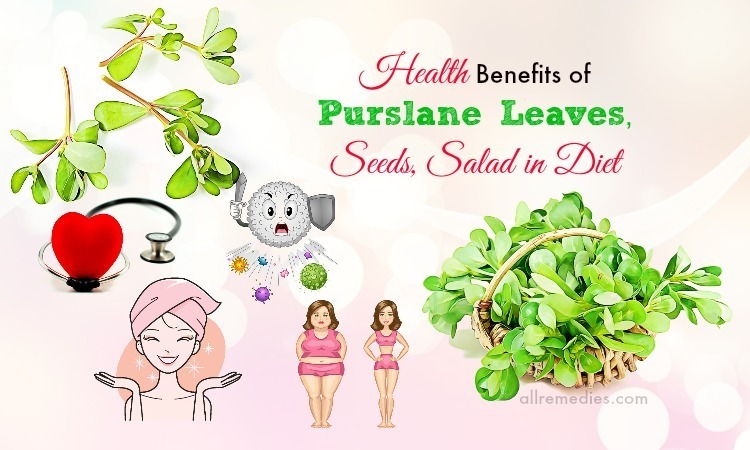 They act as a natural bleaching agent that definitely lightens up your skin and clears the dark patches around your eyes. 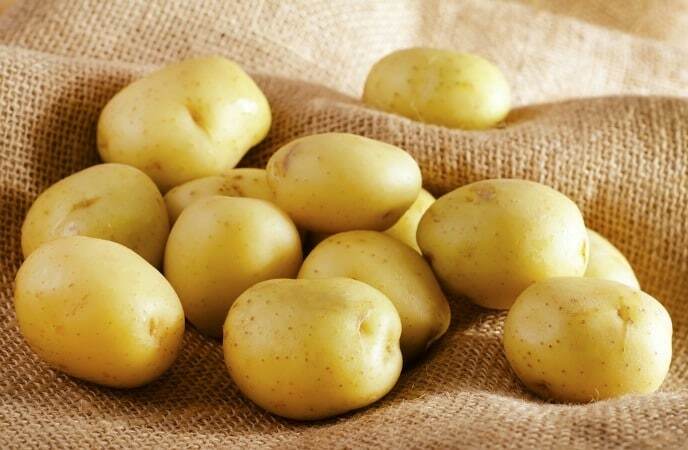 At first, you cut a raw white potato into slices. Then, you add fresh lemon juice, potato slices, and a little water into a blender. Next, you blend them well and strain the juice to a glass container. Now, you store this container in the refrigerator for 30 to 35 minutes and then you take it out. After that, you dip cotton balls into this cool juice. Then, you place these cotton balls on your closed eyes and let it stand on for about 10 to 15 minutes. After that, you wash the areas with cool water. Finally, you pat your skin dry and apply your eye cream onto the eye areas. You can store the remaining juice in the refrigerator and apply it daily. Firstly, you pour yogurt and turmeric powder in the small bowl. Then, you add fresh lemon juice into it and mix them well to make a fine thick paste. Now, you apply this paste onto the eye areas. Next, you let it stand for 10 to 15 minutes. You have to follow the way for not less than two times per week to get the best results. 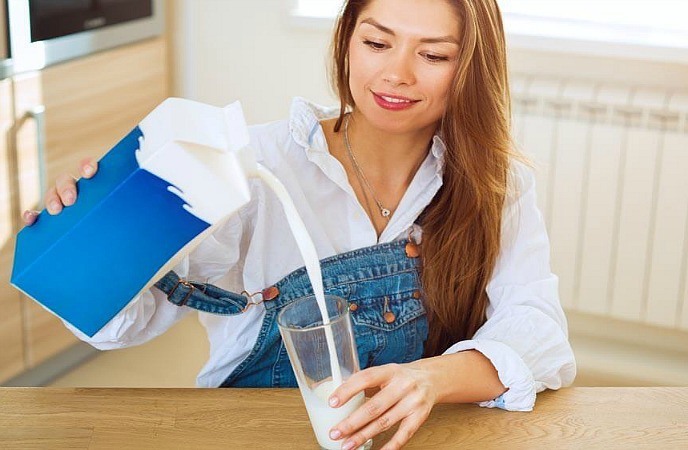 Firstly, you add milk cream into the small bowl. In this bowl, you add fresh lemon juice and mix them well. Next, you apply this mixture onto the dark rings under your eyes. Now, you let it stand for a few minutes until it dries completely. Finally, you wash the areas with clean water and pat your skin dry. Not only lemon or lemon juice is effective in treating dark circles or other beauty conditions but also lemon peel is one of the best ingredients in removing dark circles. Firstly, you take lemon peels from one lemon and then cut them into pieces. Next, you dry them up by placing them under the sunlight properly and once they dry completely, you take them out from the sun. Now, you place them on a grinder and grind them to make a fine powder. After that, you add a sufficient amount of milk into this powder and stir them well to create a thick paste. Now, you apply this paste onto the dark circles and keep it on for a few minutes. Finally, you wash the areas with clean water and then pat your skin dry to apply your moisturizer onto it. You may store the remaining powder for further usage. You should follow this method for once or twice per week. Firstly, you add almond oil and lemon peel powder into the small bowl. Next, you apply the paste onto the eye areas. Now, you use your ring finger to massage it for about 5 minutes. Finally, you wash these areas with lukewarm water. You should repeat this method regularly. Firstly, you take raw honey and fresh lemon juice in the small bowl. Then, you stir them well and apply the mixture onto the dark skin under your eyes. Now, you leave it on for a few minutes. Or, you may also add 1 teaspoon of sugar and put it in the refrigerator for a few minutes and then use this to remove the problem. You should continue doing the same way regularly. 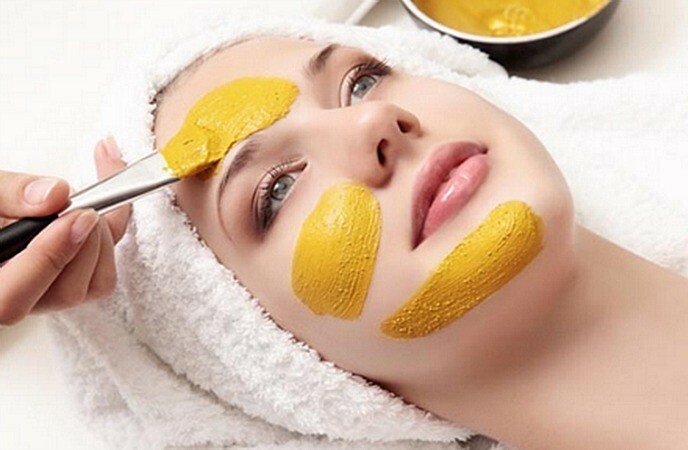 The paste which is made from some simple ingredients such as gram flour, turmeric powder, tomato puree, and lemon juice will definitely help in lightening up the dark rings under your eyes. Firstly, you mix gram flour, turmeric powder, tomato puree, and lemon juice in a clean bowl. Next, you apply the paste onto the dark circles. Now, you allow it to stand for about 15 to 20 minutes. Finally, you wash the areas with clean water and pat it dry. You should continue doing this way for at least 2 or 3 times per week. If you want to discover more ways on how to use lemon for dark circles, you should continue reading the next part of this writing! Cucumber works as a skin lightening agent and great astringent that helps to clear out dark circles around your eyes. When this cucumber is mixed with lemon juice, it will definitely assist you in preventing dark circles. Firstly, you take fresh cucumber juice and lemon juice in a clean bowl. Then, you mix them well and dip the cotton ball in this mixture. Next, you take it out and place it onto the dark rings under your eyes. Now, you wait for about 15 to 18 minutes. Finally, you wash your skin with normal water. You should do the same way daily for one week. 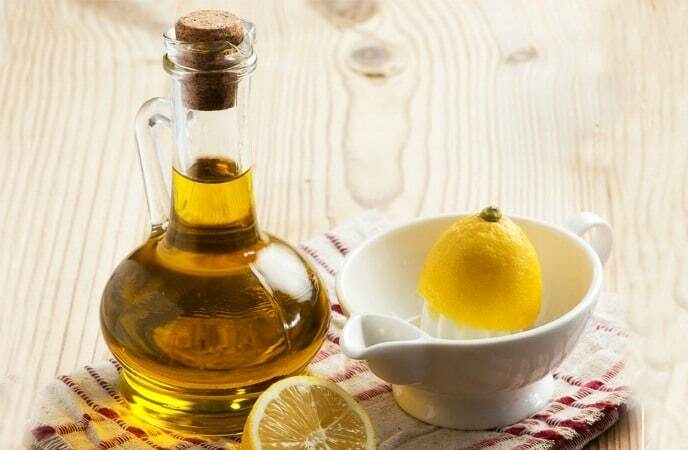 Not only applying lemon juice or lemon on the dark circles but also consuming lemon juice (alone or mixed with other ingredients) can also help to fade away the dark circles from the inside. At first, you make tomato juice with mint leaves and tomato slices. Then, you add fresh lemon juice along with salt in this juice. Next, you stir them well and drink this juice. Note: You have to consume this juice immediately after preparing it to grab its maximum benefits of removing the dark rings under your eyes. Almond oil contains mono-unsaturated fatty acids along with a good source of vitamin E and nutrients that can help to fade away the dark circles effectively. 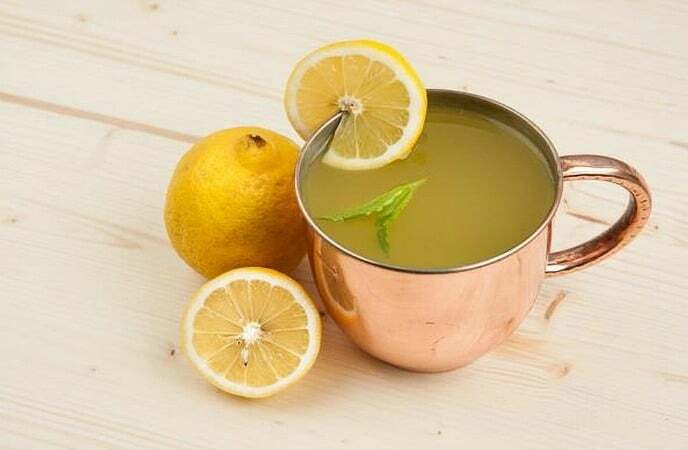 Besides, lemon contains skin lightening properties, which decrease the dark circles on your skin. Firstly, you take fresh lemon juice along with sweet almond oil in the small bowl. Then, you mix them well and apply this mixture onto the dark circles around your eye areas. Now, you let it stand on for a few minutes or for overnight. You should repeat this way daily for 15 to 20 days. Firstly, you add glycerin, rose water, and fresh lemon juice in a clean bowl. Then, you stir them thoroughly and dip cotton balls in this mixture. Next, you dab the cotton balls on your closed eyes or on the dark circles areas. After that, you wait for about 20 to 30 minutes. This way has to be repeated regularly to give you the best results. At first, you cut the fresh lemon into thin slices. Then, you place 2 slices directly onto both the eyes. But ensure that you have to close your eyes tightly or lemon juice does not get into your eyes. You should be careful and do not open your eyes when doing this way. Now, you let it stand on for about 15 to 20 minutes. After that, you wash these areas with cold water. Finally, you pat your skin dry and apply your natural moisturizer onto it to lighten up the dark circles and prevent the dryness around the eye areas. Always remember that people, who have dry or sensitive skin, have to avoid following this way because it may cause some side effects such as itching or burning sensation or irritation under your eyes. Using mild and lemon juice is also another way using lemon for dark circles under eyes that you should not pass. 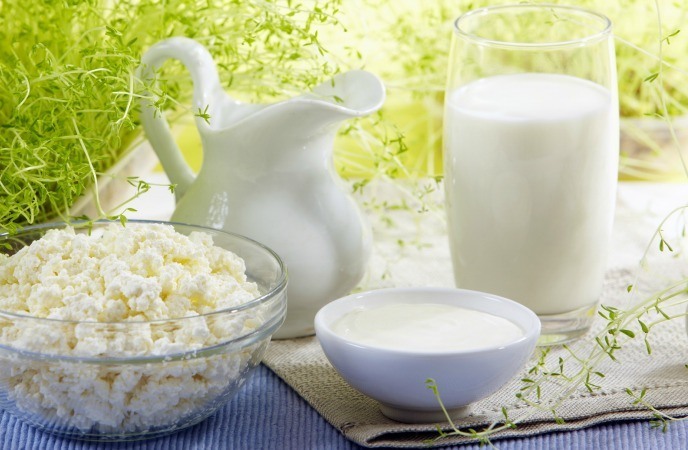 Firstly, you take fresh lemon juice along with cold milk in the small bowl. Then, you stir them well and apply the mixture onto your eye areas by using the cotton ball soaked into this mixture. Now, you let these balls sit on there for about 15 to 20 minutes or for overnight. Firstly, you cut a lemon into two halves. Then, you squeeze it to extract the juice and pour this juice into the glass of warm water. Next, you stir them well and then add honey into it. 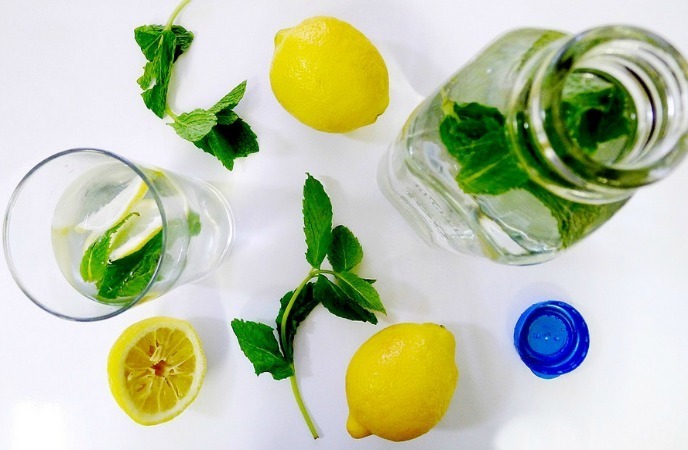 Finally, you drink this lemon water every day in the morning when your stomach is empty. This method aids in lightening up the dark circles as well as reducing the appearance of wrinkles and puffy eyes. Firstly, you place the egg white in a clean bowl. Then, you add fresh lemon juice into this bowl and stir them well to make a paste. Then, you soak the cotton balls in the mixture for one to two minutes. Now, you wring these cotton balls to eliminate the excess liquid and put them over your eyes. After that, you allow it to stand on for 10 to 15 minutes. Finally, you wash these areas with warm water before rinsing it with cold water. At first, you take lemon juice from 1/2 lemon in the small bowl. Then, you add jasmine oil in this bowl and stir them well. Now, you apply this mixture onto the dark circles by using a cotton ball soaked in this mixture. After that, you allow it to stand on for about 10 minutes. You should do the same way regularly. 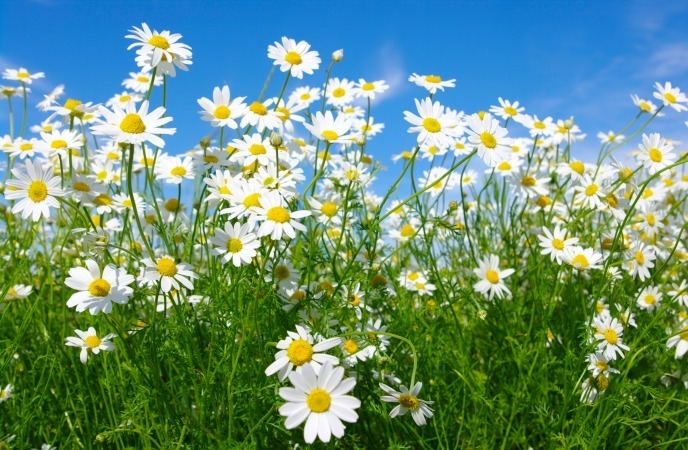 While lemon lightens up the darkness, chamomile treats inflammation. Carrots fight the eye problems and wrinkles to revitalize your skin and lavender soothes your skin. 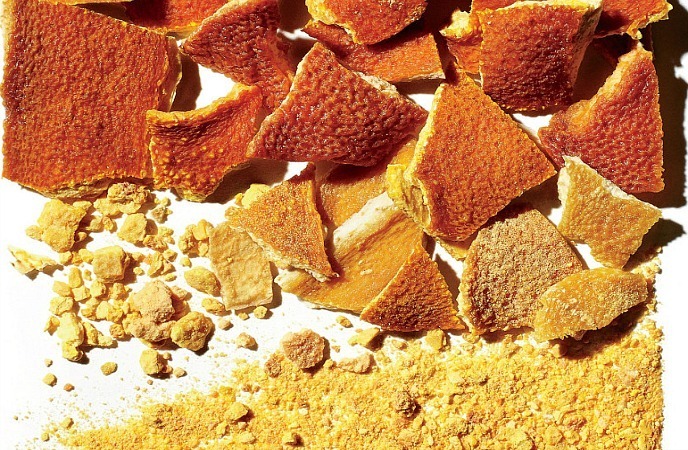 Therefore, the mixture of carrot, lavender oil, chamomile, and lemon oil is another way using lemon for dark circles that you should try! Then, you apply this mixture on the dark rings under your eyes. Next, you leave it for a few minutes. In this way, olive oil improves the elasticity of your skin and you may use it in the daytime or at night. Besides, lemon juice aids in lightening up your skin. Firstly, you take virgin olive oil along with lemon juice in the small bowl. Next, you apply this mixture onto the dark circles. Following these tips and warnings along with the above methods will give you a safe and quick relief from dark circles under eyes. Lemon is rich in vitamin C that is essential in improving your skin health. If you are not including foods rich in vitamin C in your diet, you will suffer from dark circles. Therefore, you should include lemons, grapefruits, or oranges, etc. in your daily diet. You have to discontinue using lemon and lemon juice if you are experiencing any burning, irritation, or itching on the applied skin areas. You should use fresh lemon juice instead of canned or old lemon juice to grab its maximum benefits for treating not only dark circles but also many other skin and health problems. 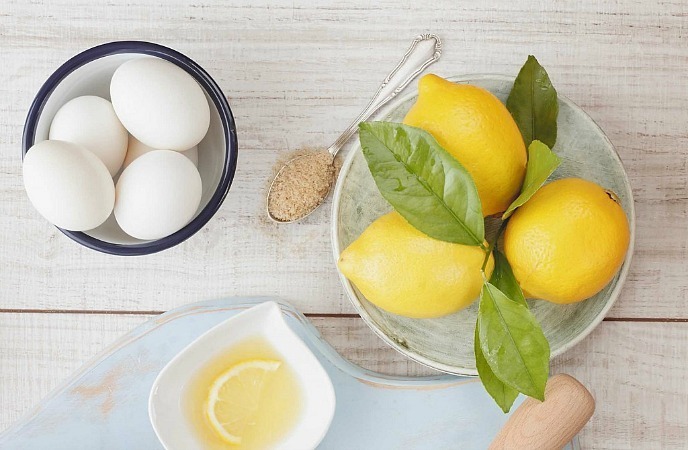 Lemon juice is effective for people who have oily skin or mixed skin types. You have to consult your doctor if you did not find any relief from dark circles within one week because it may relate to some health problems. Therefore, you go to a doctor and check thoroughly before using lemon for dark circles under eyes. 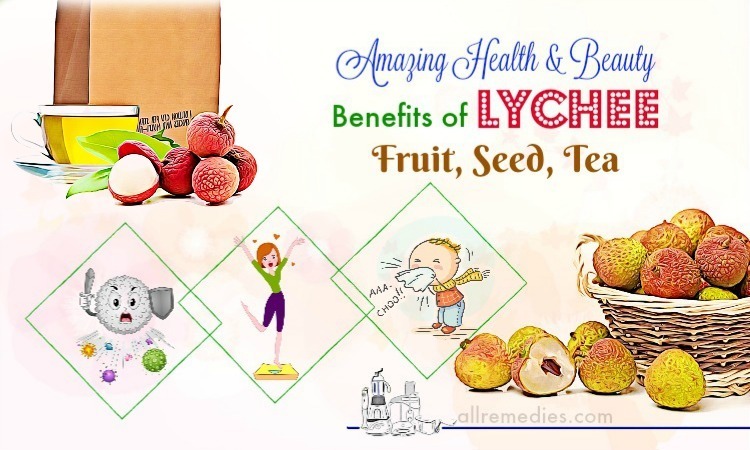 In addition to following these above lemon methods, you should relieve stress, take a break, sleep for at least 8 hours, eat nutritious and healthy food, do a few eye exercises, etc. to prevent dark circles, fine lines, wrinkles, puffy eyes, etc. 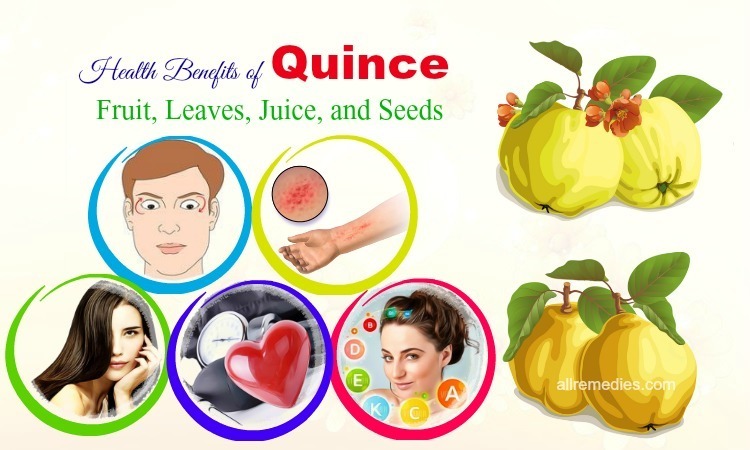 To know more information about skin care recipes and natural treatments for skin problems, go to our main Skin Care page. 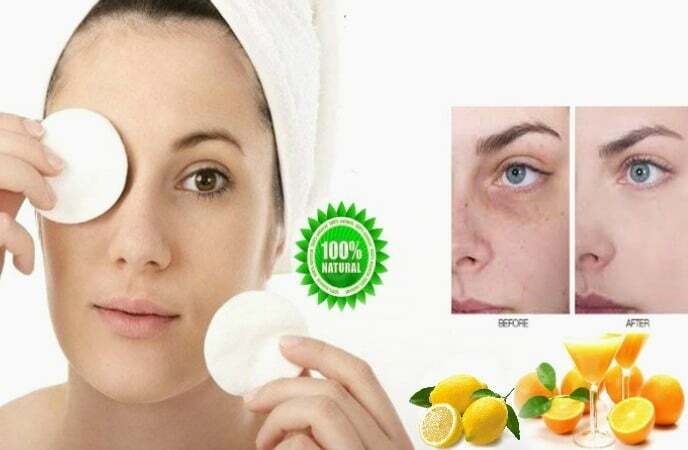 After studying the writing of 22 effective methods on how to use lemon for dark circles under eyes, hope that this article will help you learn more some easy and simple ways to use lemon for removing dark circles at home. All these remedies are safe, natural, cost effective as well as easily available for eliminating dark circles. 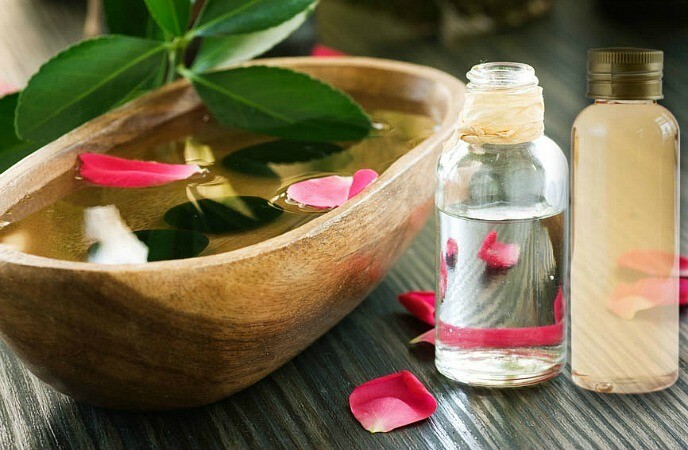 But do not forget that you have to try the remedies only after carrying out a small test, check your body reaction, and then continue using these methods to keep dark circles at bay. If you have any question or comment, please leave them below, I will respond you as soon as possible. Also, you can share your experiences with us if you know other ways on how to use lemon for dark circles under eyes.